Opinion polls strongly suggest Merkel will win easily. Recent polls indicate support for the CDU/CSU is around at 40%; with a 15% lead over the next serious contender the SPD, led by former European Parliament President Martin Schulz. But last year Merkel’s chances of re-election looked shaky, with many blaming her government’s “open door” policy towards asylum seekers. ‘If Europe fails on the question of refugees, then it won’t be the Europe we wished for,’ Merkel said when she declared that all Syrians would be eligible to apply for refugee status in Germany. Her position was grounded on positive public opinion in Germany toward helping asylum seekers, especially those fleeing the civil conflict in Syria. The lack of foresight and coordination at the federal level in supporting overburdened states encouraged resentment and disillusionment. This provided fertile ground for right wing populist parties such as the AfD to succeed in regional elections on an anti-refugee platform. During 2016, the AfD won seats in 13 out of 16 state parliaments in a result interpreted as being a reaction to Merkel’s refugee policy. The CDU/CSU suffered major losses last September, including a defeat in Dr Merkel’s own constituency of Mecklenburg-Vorpommern, and the worst election result in Berlin in the history of the party. But the CDU secured significant victories in regional elections this year, especially in North Rhine-Westphalia a previous stronghold of the SPD. It’s likely that her leadership on third country agreements on refugees has helped Dr Merkel to regain lost support. Her strong leadership on the EU-Turkey agreement, which has stemmed asylum seeker arrivals to Greece, and her support for similar deals with Libya and Tunisia, has won back the support of traditional conservative voters who want the government to ensure it retains control over the number of arrivals in Germany. Importantly, the government’s plan to boost private investment in African countries through its ‘Marshall Plan for Africa’, which aims to remove the structural push factors for why people flee, has created the impression that the government has a long term strategy in place to manage migration. What’s more, Merkel’s refusal to pander to the more right wing faction of the CSU by adopting a cap on the refugee intake has also ensured support from more left wing voters, who may have otherwise voted for the SPD, the Greens or Die Linke that all continue to support a more welcoming approach to refugees. Ms Merkel appears to be successfully playing the political middle ground on refugee policy, drawing support from across the political spectrum. The threat from the AfD is now much more muted than it was last year. Polls show AfD’s support has dropped to 7%, which is a major blow for a party which last year boasted double digit support. Internal divisions on the future direction of the party and the decision by party leader Frauke Petry not to run in the federal election has destabilised the AfD. The take-over by the party’s radical right wing faction – which has been criticised for espousing neo-Nazi views including regional parliamentarian Bjorn Hocke describing Berlin’s Holocaust memorial a “monument of shame” – has alienated supporters who fear a return to Germany’s Nazi past. Last month, in a high profile push to reignite the refugee debate, SPD leader Mr Schulz declared that a second refugee crisis was imminent given the high number of arrivals across the Central Mediterranean. He has also revived criticism of Dr Merkel’s controversial decision in 2015 to waive the EU’s so-called Dublin rules and allow Syrian refugees stranded in the Western Balkans to enter Germany, which triggered to the chaotic influx of asylum seekers into the country. Mr Schulz is seeking to remind voters of Merkel’s much criticised management of the refugee crisis that had originally undermined her subsequent loss of popularity. But it is unlikely that Mr Schulz will win the battle for the Chancellorship on a refugee platform. There are too many similarities between the two party manifestos on refugee matters, such as expanding the mandate of Frontex, the EU’s border management agency; support for new agreements with host and transit countries to manage migration; and increasing the budget for development cooperation. Dr Merkel’s calm and non-confrontational approach during the election campaign, as opposed to Mr Schulz’s attempt to alarm the populace, has given the impression that even with the high number of arrivals across the Central Mediterranean, the Chancellor still has the situation under control. Dr Merkel has so far managed to avoid making refugees a hot political issue. Although anti-refugee sentiment remains strong in some Federal States, particularly in eastern Germany, the Chancellor's hold on the country’s leadership is unlikely to be weakened by refugee issues. 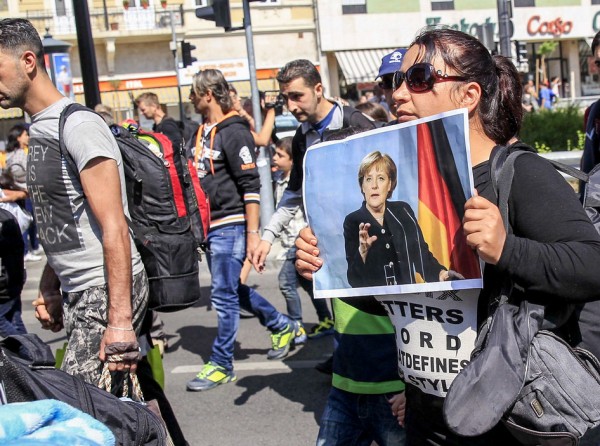 Secondary image: A woman holds a picture of German Chancellor Angela Merkel as migrants set off on foot for the border with Austria from Budapest, Hungary, September 4, 2015. Credit: Freedom House 'Syrian refugees'/Flickr. This image has been cropped.